If you’re after an early stage gold junior, this one should be up the top of your list. That’s the kind of project today’s company’s MD, Andrew Corbett, believes he has on his hands. The company is looking to bring its historically profitable flagship project in PNG back online as a large scale and low cost open pit gold mine. The mine ceased operating in the early 2000s when the gold price was sub-US$300/oz, and comes with an existing Resource of 2.8Moz, multiple expansion targets, plus stockpiles left over from historical mining. And now, with gold up around the US$1300/oz level, development is back on the cards, with the potential for mine expansion and regional exploration — a much welcomed bonus on top of the known Resource and newly identified stockpile. While capped at less than $25 million, the company offers an advanced exploration story, making the list of the top 25 Australian and PNG gold deposits along with the likes of Newcrest Mining, Anglogold/Ashanti, Barrick Gold, and Gold Fields. Coming in at number 22, with a 2.8Moz Resource, it’s fair to say the company appears undervalued, with the next on the list capped at close to $500 million. The opportunity has been recognised by at least one analyst, who, along with placing a ‘Buy’ recommendation on the stock, claimed, “we can’t find a single ASX listed gold resource of such size trading at a lower EV$/oz Resource”. Kingston Resources (ASX:KSN) has interests in two gold projects, its flagship Misima Gold Project in PNG, plus the Livingston Gold Project in WA. Back in August last year, KSN completed its earn in at the Misima Gold Project, upping its ownership of the project from 49% to 70%, in partnership with the highly credible Nippon Metals and Mitsui. (It also finalised sale of its lithium tenements at that time due to there being greater opportunity on offer at Misima). As confirmed with Managing Director Andrew Corbett, its share of Misima is still rising, with an updated estimate expected to be made available in April. 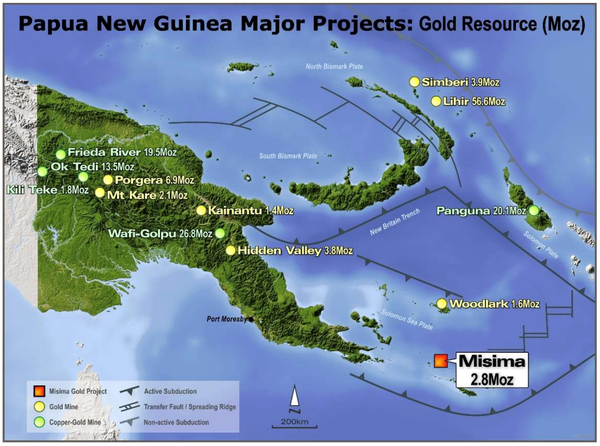 The Misima Gold Project is located in Papua New Guinea, a well-established gold mining location, with a number of big players operating mines in the country. The project is on PNG’s Misima Island, which sits about 300km east of Port Moresby. The island itself has a long gold mining history dating back to 1888 and the industry is well supported by the local community, who are keen to see the project come back online. The Misima Gold Project has an impressive history. Canada’s Placer Dome operated the project for 15 years from 1989 to 2004, during which time it produced 4Moz of gold. At its peak it produced 370,000oz, while it averaged 230,000oz per year over its life. Those 15 years were profitable and successful, with operating margins averaging 37%, and remember this was at a time when the gold price was fluctuating around US$300/oz. The extensive history and success, significantly de-risks Kingston’s plans for bringing the operation back into production..
To help deliver on those plans, there remains a Resource of 2.8 million ounces, from 82.3Mt of ore grading 1.1g/t and 5.3g/t of silver. The Resource remains because the incentive wasn’t there at the time for Placer to continue the operation. At the time the decision to close the mine was made the gold price was in the range of just US$250-US$300/oz. Now, with gold selling for around US$1300/oz., it is a whole different story. Add to that the fact that the soft, easy to process ore at Misima means costs are significantly lower than in Australia, and the margins on offer make that 1.1g/t grade look all the more attractive. It is worth noting that Placer finished mining in 2001, with a remaining 32Mt of stockpiles that it continued to process for four years. However, it didn’t feed the whole 32Mt through, leaving stockpiles at the project that KSN is now trying to find. KSN confirmed today that it had found the first of the stockpiles, identifying the location of a large stockpile of gold mineralised material at Misima. The stockpile contains 3.6Mt of low-grade material, averaging 0.5 to 0.7g/t Au. While the grade is modest, it represents loose rock, at surface and close to the likely location of a future processing plant — meaning lower mining and processing costs which make it an excellent early feed source for any future development plan. Note that this near-surface stockpile, which was confirmed by a LiDAR (Light Detection and Ranging) survey, is not accounted for in the current 2.8Moz gold Resource at the project. Also, it doesn’t need to be mined and is sitting there ready to be processed, meaning there will be minimal costs involved and therefore quite high margins despite the lower grade. By my estimates, and considering current prices, this could translate to $50-$60 million of cash flow...something that will certainly help de-risk the project at this early stage. There are likely other stockpiles to be found, although these are more of a bonus. The company’s primary focus is squarely on exploration, above and beyond the known deposits. KSN’s exploration strategy is now firmly focused on discovering and defining near-surface satellite mineralisation at prospects. Adding near-surface resources is important in these early stages of this future potential mining operation. 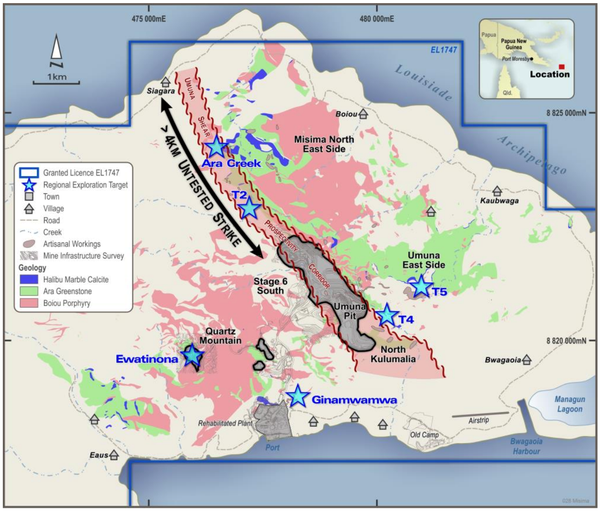 Misima Gold Project: simplified geology and exploration targets. I think there’s a good chance of success here, with limited historical exploration due to the low gold price, and early exploration results are promising. But KSN is now focusing on testing the regional exploration targets it identified in its geochemical program carried out through 2018. It has moved the rig down to the first of these targets, the Ginamwamwa prospect, where a range of holes are being drilled to test underneath the high-grade supergene gold that was identified at surface through during the successful 2018 exploration program. After completion of the Ginamwamwa program the rig will move to Quartz Mountain. The company has plans for a second rig to accelerate exploration at Misima — a small RC-Diamond combination to more rapidly test these and other satellite targets. So having tested a range of locations along the Umuna Shear beneath the old pit, KSN’s exploration strategy is now firmly focused on discovering and defining near surface satellite mineralisation at prospects including Ginamwamwa, Quartz Mountain, and Ara Creek. 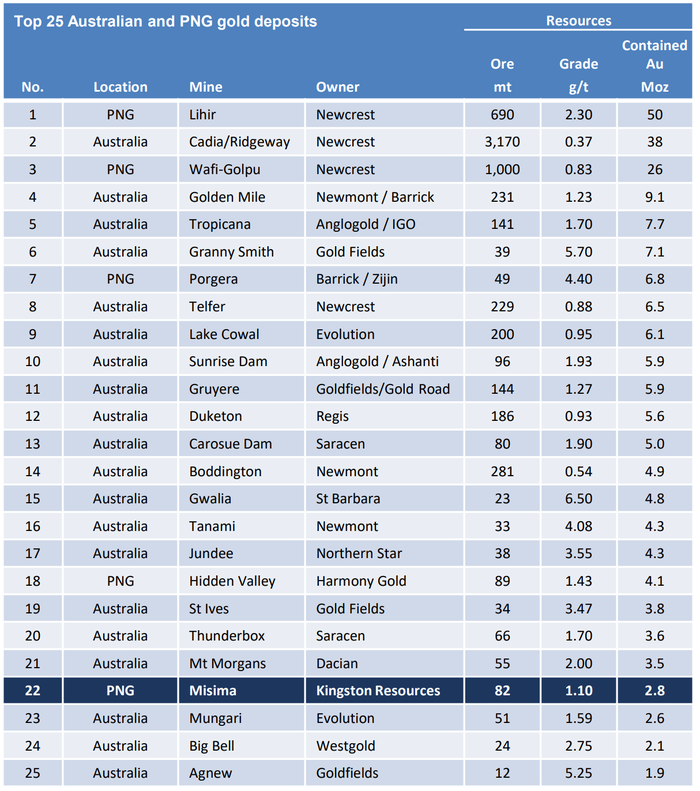 Listed below are the companies that own the top 25 multi-million ounce gold deposits in the Australia-Pacific region... you'll note that KSN comes in at 22, right behind some very well known gold companies. What’s not apparent here is that every other company is worth north of $400 million market capitalisation, while KSN still remains capped at less than $25 million. 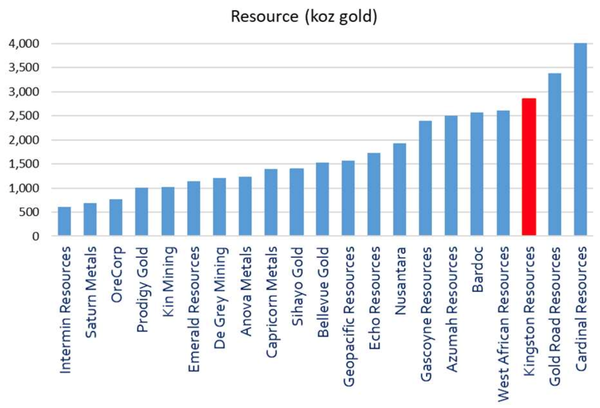 KSN is trading on a very low Enterprise Value per Resource ounce (EV/oz) basis (below), right at the lower end of gold exploration peers, at the discount price of around $10/oz of Resource, relative to an average of around $40/oz or so. Additionally, KSN has scope to increase the total Resource in a relatively short period, plus current market metrics suggest there could be a valuation uplift as the works program at Misima progresses. This clearly suggests there’s scope for a valuation lift. As put simply by Corbett, it comes down to peers having “double our market cap, half our Resource”. Keep in mind those figures only take into account the known resource, with no consideration of the significant exploration and expansion potential of Misima and its historically proven location as a top mining destination. A number of brokers have recently initiated coverage on the stock, itself an endorsement of the company and its assets, as the vast majority of ASX listed companies with a market capitalisation of this size attracting non analyst interest at all. And with ‘Buy’ recommendations and target prices at significant premiums to the current share price, it seems that the market could be missing something here, although any broker recommendation is speculative. In March, Avoca Capital stuck a ‘Buy’ rating on the stock, along with a 12-month target price of 8.4 cents — well up on the current 1.9 cent share price. 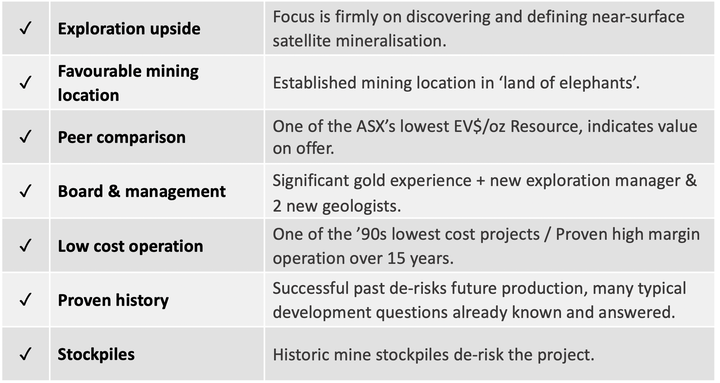 Avoca, confirmed that the bigger picture here – and what could deliver the real payoff for investors – is not the known Resource, despite it comparing so well to that of its peers, but the exploration upside potential. Already, say Avoca, recent surface exploration and drilling in 2018 has “firmed up our belief that substantial opportunity still exists outside the current Resource”. Backing that position is Patersons Securities, which has a 12-month target price of six cents. She highlighted the excellent progress on the exploration program to date at Misima, reiterating the still underappreciated exploration potential at the project. The full Patersons’ report is available HERE on Kingston’s website. Adding to its existing experienced and well regarded team, KSN has appointed Stuart Hayward as Exploration Manager. Hayward is a highly credentialed geologist with more than 30 years’ experience in mineral systems exploration and evaluation including epithermal Au-Ag and porphyry Cu-Au deposits. He was with Newcrest Mining Ltd (ASX:NCM) for more than 15 years as a Mineral Resource Manager and Principal Geologist covering their Asia Pacific and PNG projects, including time on Newcrest’s Lihir and Wafi Golpu projects. Hayward will have a particular focus on the 2019 drilling program which seeks to advance the targets identified during 2018 towards resource definition. He will be working alongside Charles Yobone and an expanded team of geologists. Two new local geologists have been appointed as regional exploration activities ramp up on the island. Managing Director, Andrew Corbett, had good things to say about the new team, “During my recent site visit to Misima it was particularly pleasing to see the expanded geological team carrying out field work on both Quartz Mountain and Ara Creek while we are drilling in a third location at Ginamwamwa”. 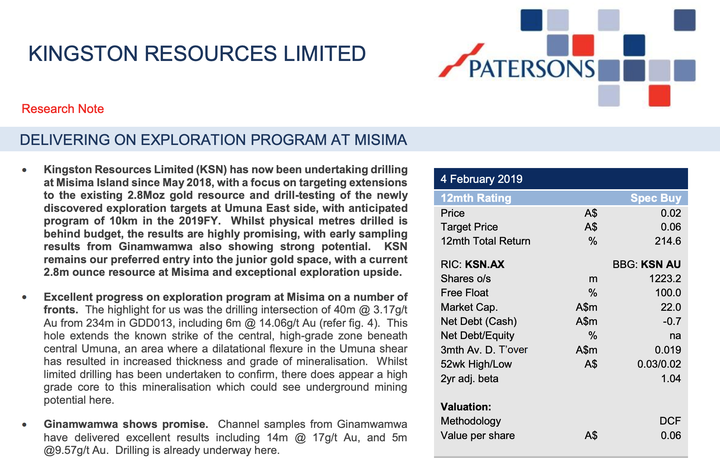 While the focus of this report has been on KSN’s flagship Misima Project — a reflection of the company’s current focus — KSN also owns 75% of the Livingstone Gold Project in Western Australia. The project is located 140km Northwest of Meekatharra, in a highly prospective location within the Bryah Basin. KSN’s strategy at Livingston looks to involve optimising a potential sale price through drilling, while retaining the potential to hold. Kingston last year extended its land holding at the project with the application to add a further 170km2 to its existing 220km2 tenement area. 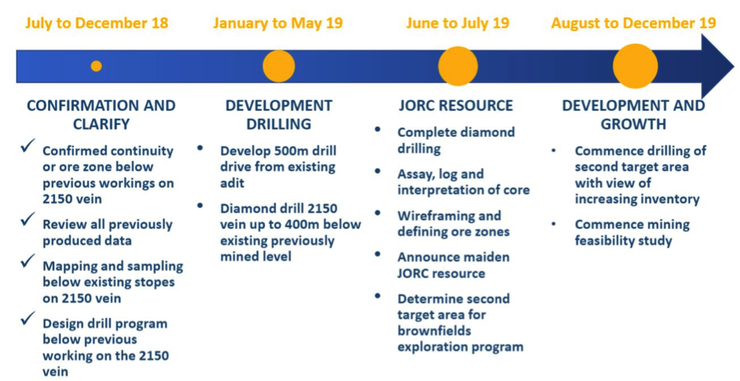 The project is a highly prospective one which Kingston plans to continue to enhance with an RC drilling program on priority targets in the coming months, while it’s already seen a number of high grade drilling results delivered through early stages of near surface exploration. “Livingstone is our stepping stone and Misima is our priority. We look at Livingstone as potential for near-term cash flow or as an asset to build up. But Misima is our main focus,” explained Corbett. With a focus on the Misima Gold Project, the company is eyeing production by 2023, while KSN will continue its exploration and kick off the mining studies late on this year. Considering the existing Resource and historical operating data, plus ongoing exploration activity and considering industry comparisons, there’s little reason to question why KSN can’t progress the Misima Gold Project to being a low cost, large scale gold producer. As drilling results continue to roll in, it seems it’s only a matter of time before the market fully grasps the potential that is on offer. From here, we’ll be keeping an out for further drilling results in the near term which could prove to be compelling catalysts.